Are you looking to monitor your diesel truck’s most vital functions to help prevent future breakdowns before it’s too late? Are you pushing your diesel truck’s limits on a daily basis or towing heavy loads over long distances? GlowShift Gauges is here to help put your mind at ease by satisfying all of your diesel truck needs with our Custom Diesel Gauge Package. Whether you’re driving a Ford Super Duty Powerstroke, Dodge Ram Cummins, or a Chevy/GMC Duramax truck, GlowShift’s Custom Diesel Gauge Package is a must have for any diesel truck owner as it comes standard with three of our 7 Color Series Gauges, a vehicle specific triple pillar pod, as well as optional add on accessories to your gauge package including sensor thread adapters and a three gauge wiring kit. 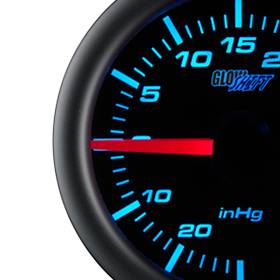 GlowShift allows you to select up to three gauges from either one of our 7 Color Gauge Series which includes the Black 7 Color Gauge Series, Tinted 7 Color Gauges Series and White 7 Color Gauge Series. Our Black 7 Color Gauges feature a 52mm black gauge face with a clear lens for easy viewing at any time of the day. Our Tinted 7 Color Gauges feature the same 52mm black gauge face as our Black 7 Color Series, but come with a tinted lens for that unique, smoked out look. The White 7 Color Gauge Series features a 52mm white gauge face with a clear lens. All of our 7 Color Series come standard with incredible abilities including 7 Color LED through dial lighting and stepper motor technology for our electronically driven gauges. Stepper motor technology allows for exceptionally smooth needle movement and extremely accurate gauge readings that users expect from a reliable gauge regardless how much your truck is shaking or pulling. Listed below are some of the most popular gauges that diesel owners choose for their truck. Those gauges are the 35 PSI Boost, 60 PSI Boost, 1500 F Pyrometer EGT, 2400 F EGT, Transmission Temperature, 100 PSI Fuel Pressure and 30 PSI Fuel Pressure Gauges, as well as components that come with each gauge and installation accessories that we recommend for that particular gauge. 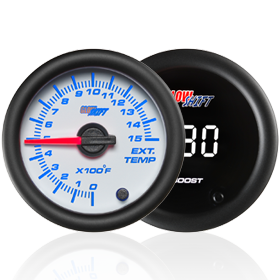 GlowShift’s 35 PSI Boost and 60 PSI Boost Gauges are mechanically driven and monitor your truck’s turbo is running at optimal levels and does not over boost, which could result in critical engine damage. These diesel boost gauges come standard with 9 feet of boost hose and a ferrule fitting which allows you to drill and tap your intake manifold for accurate gauge readings directly from the source. Users can drill and tap into their intake manifold by using our 1/8 NPT Drill and Tap Kit which features a Type R drill bit and 1/8 NPT tap for an extremely easy and efficient installation. If you’re driving a 1998 – 2010 Dodge Ram Cummins, the Boost Bolt Adapter is recommended for installing a boost gauge to the intake manifold because it easily allows you to thread into the manifold and install the barbed fitting that comes included with your diesel boost gauge. 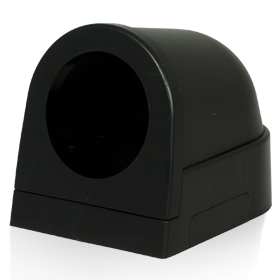 GlowShift’s 1500° F Pyrometer and 2400° F EGT Gauges are electronically driven and extremely important to any diesel truck pulling heavy loads by monitoring your engine’s exhaust gas temperature. If your EGT is running too hot, this could result in engine failure and extremely costly repairs. Each pyrometer gauge features a type K thermocouple EGT probe that features 6 feet of steel braided cable with 1/8 NPT threads, allowing it to be easily installed directly to your exhaust manifold. Users can install the EGT probe into the exhaust manifold by drilling and tapping with our 1/8 NPT Drill and Tap Kit. For users not looking to drill and tap into their exhaust manifold, we offer an Exhaust Temperature Bracket that you can drill and clamp the EGT probe to your exhaust pipe. 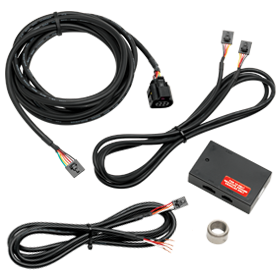 GlowShift’s Transmission Temperature Gauge is electronically driven and perfect for any diesel truck towing heavy loads over long distances. This gauge utilizes a 1/8 NPT electronic temperature sensor that’s easily installed to the test port and reads your transmission temperature from 100° – 300° F with unrivaled accuracy. If you’re driving a 1994 – 2008 Dodge Ram Cummins, a Transmission Test Port Extender is required when installing any of our transmission temperature gauges. If the test port extender is not used, the internal transmission parts can break the sensor which could result in major damage to your test port. 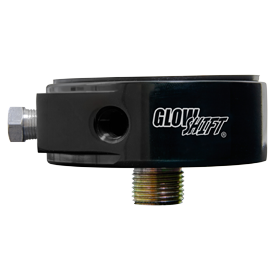 GlowShift’s 100 PSI Fuel Pressure Gauge is electronically driven with the included 1/8 NPT fuel pressure sensor that monitors your fuel system’s pressure is at optimal levels. It’s imperative for diesel owners monitor this because if your fuel system’s pressure is too low, it could be a direct result in a loss of horsepower and damage to your fuel pump or injectors. This fuel PSI gauge can be easily installed to your fuel bowl with the required fuel pressure adapter available for both Ford 6.0L Powerstroke and 7.3L Powerstroke Diesel engines. GlowShift’s 30 PSI Fuel Pressure Gauge is electronically driven and reads your fuel system’s pressure from 0 – 30 PSI with superior precision. This fuel PSI gauge is perfect for diesel truck that is running lower fuel pressure levels and as I mentioned above, if you ignore to monitor your fuel system, it can lead to a loss of horsepower and extremely expensive repairs to your fuel pump or injectors. 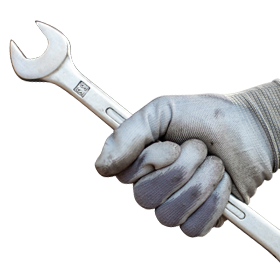 If you’re driving a 1998 – 2010 Dodge Ram Cummins, a few installation accessories that should be used with the 30 fuel PSI gauge are the Snubber Valve and the Banjo Bolt Adapter. The snubber valve is used to regulate the fuel pressure spike at startup and the banjo bolt adapter replaces your stock banjo bolt, allowing for an easy installation of the snubber valve. Users can choose from numerous vehicle specific pods for their diesel truck that can be installed directly over the existing A-pillar or as a complete replacement pod by removing your factory trim. We are continuously adding new pillar pods to our lineup based upon customer requests or the popularity of a new vehicle, so we’ll always have what you’re looking for. Select colors are available for certain triple pillar pods, but colors generally include black, gray, and tan/taupe. Our triple pillar gauge pods are manufactured from high quality ABS plastic which allows the pod to withstand fading, cracking, warping, and can even be painted to match your factory interior by using ABS plastic paint. A pillar kit is included with every triple pillar pod sold with screws and matching pod color screw caps to install over your existing A-pillar and for the complete replacement pods, a factory trim bolt is included for a secure, factory fit. If you have any questions or concerns about the Custom Diesel Gauge Package and all of its components, please do not hesitate to ask us. We are more than happy to help you with anything you’ll need!